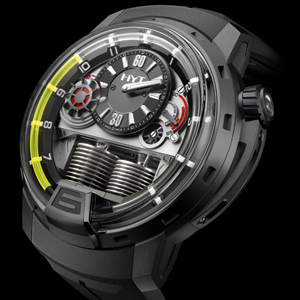 H1 by HYT is still making plenty of noise. This impudent timepiece makes a new appearance, all in black. 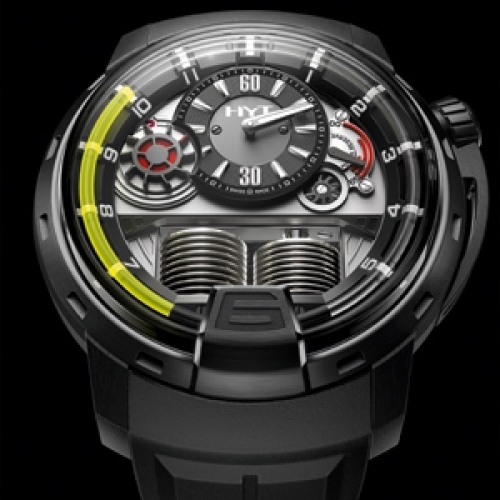 The Hydro Mechanical Horologists at HYT – the alchemists of the extreme behind this fluid fantasy – have turned an utopian dream into reality: to incorporate liquid into a mechanical wristwatch. As one of the two reservoirs at 06:00 compresses, the other expands and vice versa, pushing the fluids through the capillary tube. As the hours pass, the fluorescent liquid advances inside the tube. The half-moon meniscus marks the boundary where the two fluids meet to indicate the hour. At 18:00, the liquid returns to its initial position in a retrograde movement. The upper section of the watch is an unstructured geometry of superpositions and reliefs. The small seconds counter which overlaps the minute regulator in the centre bears a striking resemblance to a waterwheel. An intuitive time-telling object and high-flying mechanics that blow existing approaches apart. The inspired design leaves no doubt as to the revolutionary nature and out-of-the-box creativity of the whole.